Highlights: Dining on a traditional Southern Indian breakfast of Masala Dosa (stuffed indian crepes) at the famous Indian Coffee House, Riding elephants to the largest & most ancient fortress in Rajasthan – Amer Fort, visiting the Spice & Textiles Bazaars for the best cooking and home-decor wear, climbing to the top of Monkey Temple at sunset to feed the local monkeys; dining on a traditional Rajasthani Thali (Indian feast) in the home of locals. Some experiences you just cant put into words, and today was full of those. We started off our morning with a visit to the famous Indian Coffee House where we had the opportunity to dine on delicious Masala Dosa, a common breakfast food in Southern India. The crispy crepes were filled with a savory mixture of potatoes, vegetable, & spices and served with a myriad of curries and sauces on the side – delicious. We spent the early afternoon riding majestic Indian elephants to the top of Amer Fort just outside the city of Jaipur. 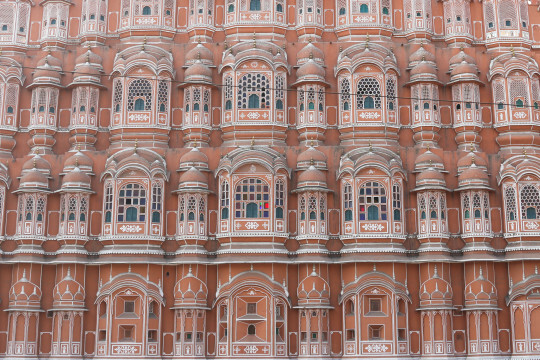 We learned about the Rajasthan as the Land of the Princes, home to some of the grandest fortresses, ancient temples, and regal palaces in all of Asia. 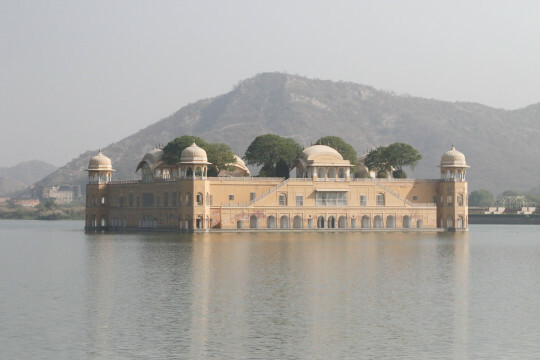 Amer Fort and the 12 kilometer city wall attached to it, was what protected the capital of Rajasthan (modern-day Jaipur) from invaders during the 16th-17th centuries. We explored the fortress for many hours, seeing incredible sites such as the palace of mirrors, the old city, and the royal mansion. When you shop through the Bazaars you can’t help but notice the delicious smells coming from the roadside food stands from local dishes such as Baati Churma, ghevar, laal mans, Kachori, sabzi… While you must be cautious when sampling Indian delicacies on the streets – you would miss out terribly if you didn’t try. Deserts made with the perfect blend of nuts and dried fruits, sweet saffron lassis, fried dumplings filled with a delicious spice mixture, crunchy samosas, are all temptations worth giving in to. As this is a culinary expedition, we focus on learning about the culture of the people and history of the place – through culinary experiences. 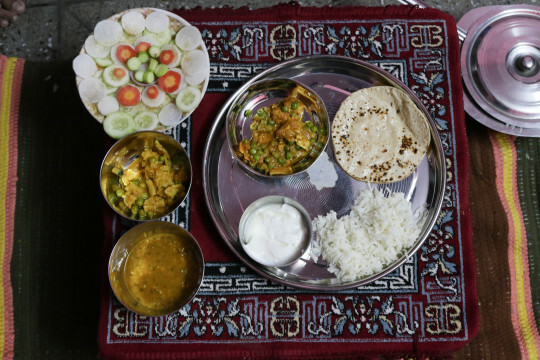 Tonight’s culinary experience cannot be put into words, as we were graciously welcomed into the home of locals to dine on an authentic Rajasthani cuisine. This was our first experience eating a traditional Indian Thali. A thali is a variety of dishes (i.e. curries, chutneys, breads, and rices) served together on a traditional Indian platter. We were welcomed into the home by the entire family, grandmas, grandpas, aunts, uncles, sisters, cousins, etc.. and directed to sit down on two beautiful carpets in their small sitting room as they gathered around at the doorway to look in. In front of each of us was a small table adorned with a beautiful red Rajasthani carpet, on top of which was placed the traditional Thali plate. 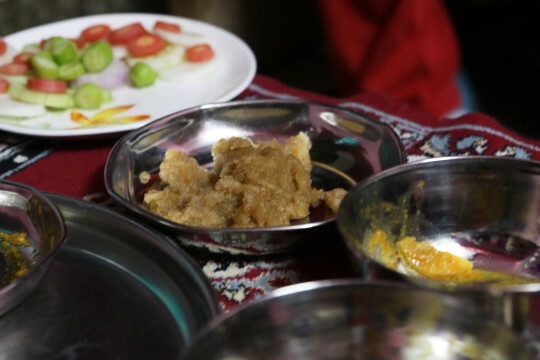 First we were served a lentil dish known as dal, followed by a vegetable curry known as sabzi and a paneer masala. The food just kept coming as they brought our homemade yogurt kurd, spiced rice biryani, and delicious indian bread chapati, ending with a delicious traditional dessert known as Halwa made from wheat, butter, sugar, and dried fruits and nuts. Today was an experience we will never forget.